For high traffic work environments, the Tork Smartone Mini Toilet Tissue pack works with any budget. When used with the corresponding dispenser, they all you to remove a single sheet of paper each time for improved hygiene and reduced waste. These high capacity rolls have a soft design that is gentle against the skin and a larger sheet dimension for added comfort. Alongside this, SmartCore technology makes it easier to extract the core for easy disposal. This large and economic pack size is a greener option for businesses as it reduces the transport costs across the life of the product. 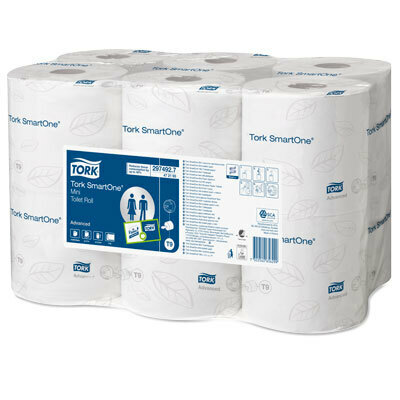 This toilet tissue pack is compatible with the Tork Smartone Mini Twin Toilet Roll Dispenser T9.